Sync Checker For Mac is diagnostic software which can check if two folders or disks are perfectly synchronized, i.e. if they have exactly the same contents. When creating backup copies of valuable files, or when making sure that two computers or mobile devices work on the same set of data, the status of being in perfect sync can be very important. Sync Checker For Mac can verify whether a pair of file collections are matching exactly or not. In other situations, it might be interesting to find differences between file sets. For example, you might like to know which files have changed on your computer, comparing a Time Machine backup of last Friday with one of last Tuesday. After performing a sync check, Sync Checker For Mac will either confirm that all files are identical, or it will present all detected mismatches. You can browse through the differing items, analyzing exactly where a mismatch occurred, and if the differences are critical or negligible. Filter tools help you to navigate through large sets of mismatching objects. You can also create a textual report of the results which can be printed or exported. 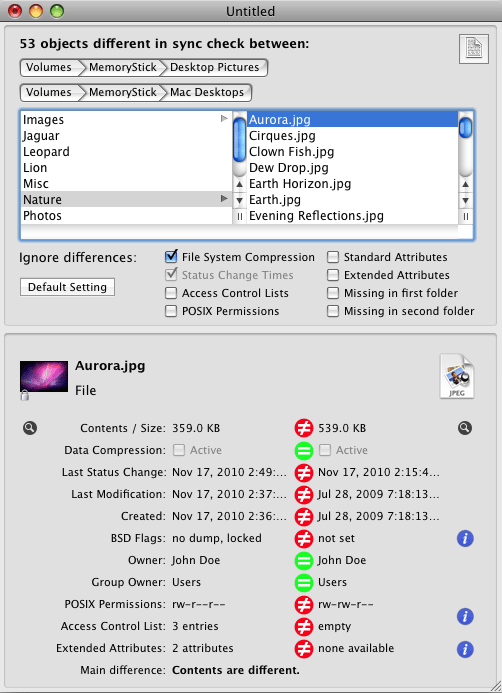 Sync Checker For Mac software is distributed electronically. You can download Sync Checker For Mac and test it before you decide to purchase a license for unrestricted usage. A time machine that synchronizes your documents and controls their versions. Repair, clean, and optimize your registry. Qweas is providing links to Sync Checker For Mac 1.0 as a courtesy, and makes no representations regarding Sync Checker For Mac or any other applications or any information related thereto. Any questions, complaints or claims regarding this application Sync Checker For Mac 1.0 must be directed to the appropriate software vendor. You may click the publisher link of Sync Checker For Mac on the top of this page to get more details about the vendor.